The IMS- EQHSM system consists of Integrated ISO 9001:2015, ISO 14001:2015 and OH&S systems. The EQHSMS is central to strategy for developing a quality, environmentally sustainable business. By implementing Quality management system, Environmental management system and Occupational health safety management system, companies maintain their impact and risk. By implementing Integrated Management System (IMS), the performance of the employees can be improved which helps in reducing cost of production and maintaining quality of products. Global Certification Consultancy has introduced EQHSMS - IMS certification documentation kit, which helps organizations to resolve environment, quality and occupational health and safety issues within organization's day-to-day activities and accelerate overall integrated system certification process. HSE consultant from USA, having global clients in more than 65 countries, offers EQHSMS - IMS Documentation Kit - 2015 for Integrated Management System Certification which is integrated management system combined documents for IMS certification. This editable ISO documentation kit contains well-designed sample EQHSMS documents as per requirements of ISO 9001:2015, ISO 14001:2015 and OHSAS 18001 standard as well as IMS Manual, IMS Audit checklist etc. 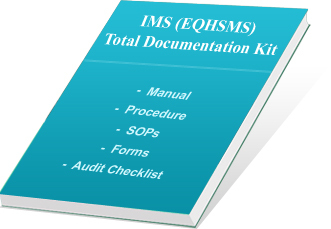 Total EQHSMS documents and IMS Manual are written in editable MS Word format in plain English. Total quality, environment, health safety management system standard documentation kit is prepared by a team of highly-qualified ISO auditors and management consultants. Any organization can easily modify it as per their company’s requirement and within 5 to 8 days their entire IMS documents with all necessary controls and IMS Manual and IMS Audit questions will be ready. With the help of this ready to edit integrated EQHSMS documents, our many global clients are certified for ISO 9001, ISO 14001 and OHSAS 18001 from any stringent certification audit in the first go. What Does Integrated EQHSMS Completely Editable IMS Standard Documentation Kit for Certification Offer? EQHSMS Manual (10 Chapters and 4 Annexes). IMS Certification Procedures (17 Procedures). Integrated Environment, Occupational Health and Safety Management Plans ( 06 EHSMPs). Blank Formats (80 sample forms). Filled Sample Formats (35 filled forms). Standard Operating Procedures (59 SOPs). Sample filled Hazard Identification and Risk Assessment (HIRA) sheet. QMS 9001:2015, EMS 14001:2015 and OHSAS 18001:2007- IMS checklist, EQHSMS audit checklist questionnaire (More than 1000 IMS Audit Questions). EQHSMS process flow charts (11 process flowcharts). These globally used EQHSMS documents cover sample copy of Quality, Environment and Safety IMS Manual, and clause-wise details of EQHSMS system as per ISO 9001:2015, ISO 14001:2015 and OHSAS 18001 standards. The documents includes list of procedures as well as overview of organization and covers tier-1 of EQHSMS documents. It also includes sample copy of mandatory procedures covering all the details like purpose, scope, responsibility, how procedure is followed as well as list of exhibits, reference documents and formats. It covers guideline for processes, flow chart and process model useful for process mapping. Also included are sample copy of blank forms and ISO templates for easy guidance to create EQHSMS quality, environment and occupational health safety certification documentation. In this editable documentation kit total more than 1000 questions are given for ISO 9001:2015, ISO 14001:2015 and OHSAS 18001:2007 requirements for IMS system. It also covers department-wise IMS Audit questions for quality management, environment management, safety, health, marketing, purchase, production, quality control, engineering and utility, maintenance, risk management, waste management, stores, packing & dispatch, administration & training, etc., which can be used as a very good tool for logically auditing during internal audit for integrated management system. The entire Quality, Environment, Health Safety Management System Documentation Kit is available in editable word format so it is very easy to edit and our more than 400 satisfied clients all over the world have used it and successfully implemented environment and safety management system as per requirements of QMS 9001, EMS 14001 and OHSAS 18001 within their organizations. By using these documents, you can save a lot of your precious time while preparing the EQHSMS documents. Takes care for all the sections and sub-sections of ISO 9001:2015, ISO 14001:2015 and OHSAS 18001 standards and helps you in establishing a better system. Our documentation kit enables you to change the contents and print as many copies as you need. The users can modify the documents as per their industry and create own EHSMS documents- IMS documentation for their organizations. Readymade EQHSMS templates and sample documents are provided, which can reduce your time and cost of document preparation. The audit questions helps in making a perfect IMS Audit checklist. You will get better control on your system, as our proven formats and templates are developed under the guidance of our experts and globally proven consultants having rich experience of more than 20 years in ISO consultancy. During preparation of documentation kit, it is verified and evaluated at various levels of our team and more than 1000 hours are spent in preparation of this ISO document kit. Prepared by globally proven team of leading IMS consultant. Integrated ISO 9001:2015, ISO 14001:2015 and OHSAS 18001:2007 EQHSMS Documentation Kit is available at a very compatible rate and any one can purchase it with secure online transaction with Paypal.com. We provide FTP download password for e-delivery of EQHSMS documentation kit and our EQHSMS documentation kit is used in more than 65 countries.